On average, we get to spend about 40 hours a year with your kid, while you on the other hand are probably spending about 3,000 hours with them. Parents will always be the primary influence on a kids life. Research also shows that having another positive adult influence in a kids life, vastly increases their likelihood of success. So what if we the church, were partnering with you as parents, to make the maximum impact in the life of your kid! We want to provide you with an amazing FREE resource that ties directly into our mission and vision for your students! The Parent Cue App has been designed for parents of babies through high schoolers, with prompts that will come in the form of videos and things to talk about in the morning, at meal time or while you are cuddling with your toddler or driving in the car with your teenager. 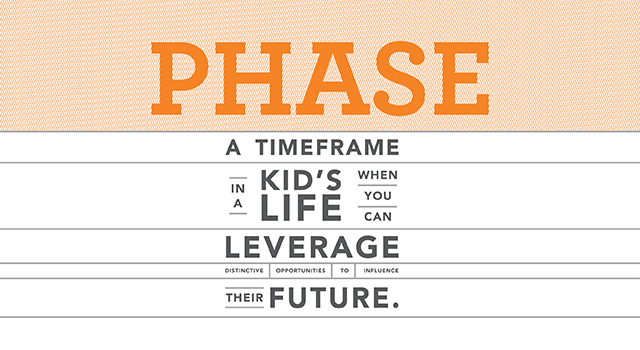 Each week there’s even a Phase Cue to help you understand the developmental phase your child is in today. Give it a try by downloading it for free in the Apple or Google Play App Stores. Our dedicated and passionate small group leaders are for your students! That means that they are also for you as parents. If you would like to connect with your student's small group leader, we would love to help you with that! We at Casas Church believe in having an intentional strategy to leverage every single phase of a kids life, birth through graduation, to help them experience a life-giving relationship with God. There has actually been a whole lot of research done on the different phases of a kid's life, and we would love to share that information with you. Besides giving you a snapshot of a piece of our mission, we hope it helps you in very practical ways as a parent.